Out of concern for the quality of the wines and in order for them to be enjoyed to the full, the vines are cultivated with the greatest respect for their local origin. The production of quality grapes is the subject of rigorous manual cultivation in order to obtain a low yield.. Working the soil through digging and the limited application of pesticides according to a strict regime favour perfect ripening of the clusters of grapes. The varieties of grape used for the production of the estate’s wines are pinot noir for the red appellations, and chardonnay and aligoté for the white appellations. The parcels of ground under cultivation are situated in four communes: Chorey-les-Beaune, Pernand-Vergelesses, Pommard and Volnay. To find out more about the vines, click here. Picking is strictly according to Burgundy traditions. When ripe, grapes are gathered exclusively by hand and transported to the estate in crates. After sorting, the grapes are lightly crushed. The grapes are transferred to a vat. The whole cluster is macerated without pressing, with only daily over-pumping in order to obtain the full aromatic structure and colour of the wine. The time in the vat is about 15 days with alcoholic fermentation. Rigorous care and attention is paid to the wine daily during fermentation, an important stage in its life (monitoring density and temperature control). Pressing is carried out following generations of pure Burgundy tradition using a vertical hydraulic hand press. .
After sorting, the clusters of grapes are lightly crushed and directly pressed in a top-quality vertical hydraulic manual press. 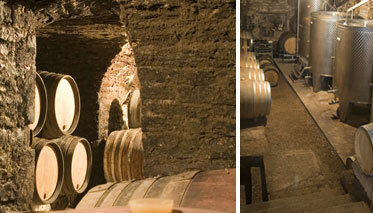 Alcohol fermentation is carried out in a stainless steel vat for about 8 days and then the wine is racked. Ageing of the wines takes place in oak barrels (10% new barrels) for all 1er cru and village appellations for both red and white wines. In the case of regional appellations, part is aged in stainless steel vats. Malo-lactic fermentation takes place during this period. Ageing of the wines varies from 15 to 24 months according to the local area and type of wine in our magnificent 15th century vaulted cellars. We carefully monitor all our wines, using an independent and approved wine laboratory throughout the ageing process and until they are bottled. 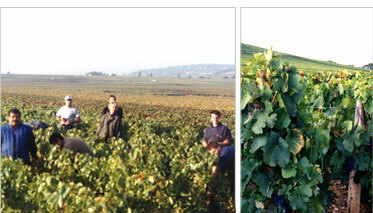 In accordance with Burgundy tradition, grapes are picked by hand. All our 1er crus and village appellations age in our 15th century cellars - some of our regional appellations are aged in stainless steel vats. 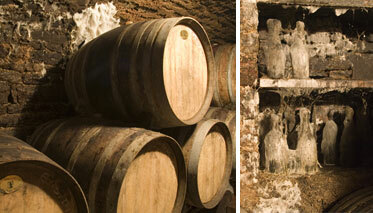 Ageing of our wines takes place in oak barrels - Aged bottles wait their time of tasting in our cellars.